The size range of Eukaryotic cell is from 2 to 100 micrometre in diameter. The genetic material is located in nucleus, chloroplast, and mitochondria. It contains nuclear membrane, nucleolus, and histone proteins. It has more than one number of chromosome. The chromosome is linear in shape. Mitosis and meiosis mechanism is observed in the eukaryotic cell. Genes of these type of cells are separate and not in cluster form. Plasma membrane shows the presence of sterols. The ribosome is of the 70S and 80S structure type. The 70S type ribosome is located in mitochondria and 80S type ribosome is located in rough endoplasmic reticulum. 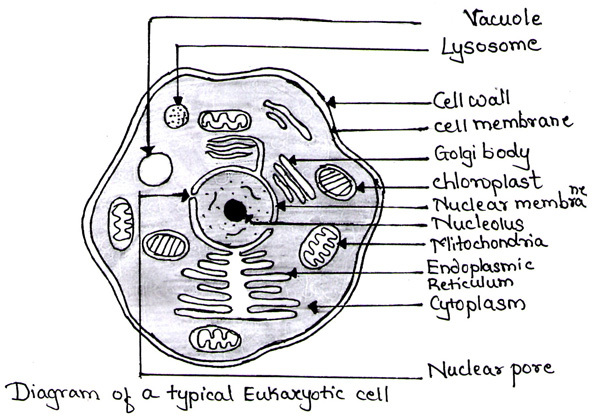 Gas vacuole and mesosomes are absent in eukaryotic cells. The respiratory system is present in mitochondria. These cells may show the presence of lysosomes. The anaerobic energy-yielding mechanism is shown through glycolysis leading to lactic acid production. Eukaryotic cells lack the ability to fix atmospheric nitrogen. Magnetogenesis is absent in eukaryotic cells. It shows about 40 % of the G+C content. Protein synthesis is carried out on rough endoplasmic reticulum. The cell wall is present in plants algae and fungi but absent in protozoa and animals. The cell wall is composed of polysaccharide and shows the absence of peptidoglycan. It shows the absence of flagella pilia and capsule. Examples:- Plants, animals, algae. fungi and human beings.